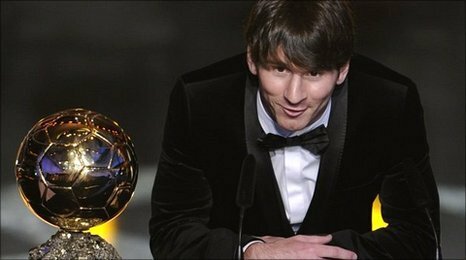 The famous forward for Argentina and Barcelona Lionel Messi has won the inaugral FIFA's Ballon d'Or or the Golden ball award. The ceremony was held in Zurich. On the other hand Jose Mourinho , Real Madrid coach won the Coach of the year award for 2010. 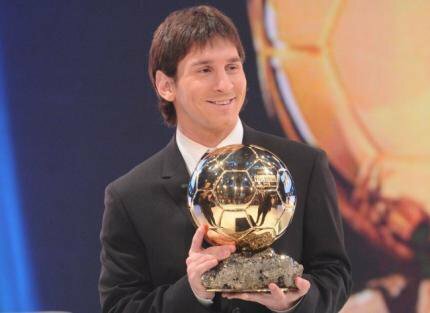 Messi had also won the Ballon d'Or last year as well when the award was not merged with FIFA. Messi was amongst three of this Barcelona team members initally had been shortlisted for the award including Andres Iniesta and Xavi. But Messi was the one to be honoured at the end. Messi said: "To win it makes it even more special. I want to share it with all of my friends, my family, all the Barcelonistas and the Argentinians." In other awards Turkey's Hamit Altintop won the Puskas Award for Goal of the Year for his goal playing against Kazakhstan. Brazilian striker Marta won the Women's Player of the Year for a fifth consecutive time and Silvia Neid,German women football coach won the Women's Coach of the Year. Messi scored a remarkable 60 goals for club and country in 2010, though Iniesta's winning World Cup goal was more in contention but according to votes by the journalists and people in panel favoured Messi. The last player to win the Ballon d'Or award twice in a row was Dutch striker Marco van Basten in 1988 and 1989, while Messi's former Barca colleague Ronaldinho won the Fifa prize in 2004 and 2005.